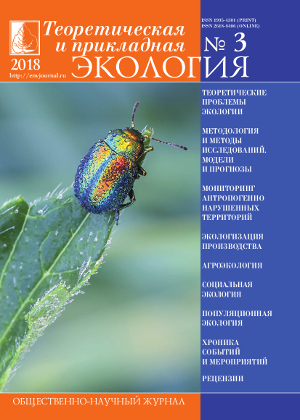 The journal “Theoretical and applied ecology” deals with the most topical environmental issues of Russia and of the world, it offers contemporary ways of dealing with those issues, as well as new theoretical and methodological approaches to assessing technogenic contamination of the environment and the ways of rehabilitation of chemically contaminated areas. One of its main tasks is to reflect the role of protection of biosphere inn sustainable development of the society. Some thematically-oriented issues of the journal deal with the problem of safety of chemical weapons destruction, development of industry and agriculture, preserving the mineral resources and the protected natural areas, to managing the consumption of natural resources. The articles in the journal touch upon a wide range of ecological issues methodology and methods of ecological research, monitoring of anthropogenically damaged territories, ecotoxicology, ecological risk and ecological safety, social ecology, issues of nature management, education and enlightening, preparing qualified teachers and scientists in such specialties as Ecology, Geography, Biology, Chemistry. The main type of publication in the magazine are the following: analytical surveys on the most topical ecological issues, scientific articles presenting the results of original research, scientific reviews, chronicle of events. Due to variety of ecological issues touched upon in the journal specialists in different spheres of science (Biology, Ecology, Geography, Geology, Soil Studies, Chemistry, etc.) can offer their articles to the journal and share the results of their research with the scientific community. The research spheres for publication are the following: 03.00.00- biological sciences, 02.00.00 – chemical sciences, 25.00.36 – Earth sciences, the researchers are scientists working in higher educational establishments, researchers of research institutes, graduate and post-graduate students, specialists in Ecology and Environmental Management of federal and regional level, members of social and international organizations. 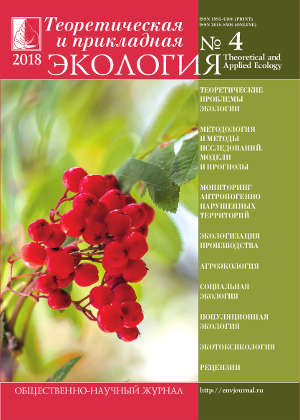 The aim of issuing the journal “Theoretical and applied ecology” is informational support of fundamental and applied research conducted on regional, federal and international level in the sphere of ecologically safe development of industry, preserving the mineral resources and biosphere sustainability, as well as of a well-though way of consumption of natural resources. The journal sets a very important task – to put together theoretical and applied issues of Ecology and Nature Management, uniting the creative potential of those people and organizations which are interested in preserving the nature and providing ecological safety. The articles published in the journal generalize the most contemporary experience of certain organization and specialists in the sphere of nature management. The journal lets a wide range of readers, scientists, representatives of legislative and executive branches get to know the research results. 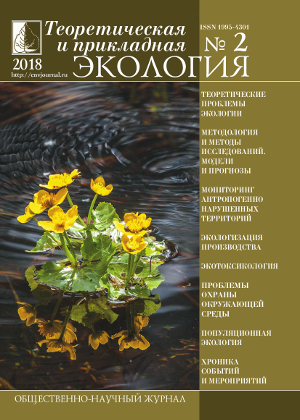 One of the main tasks of the editorial board of the journal consists in increasing the quality of the journal and to inform people of the journal with the help of the Map of Science of Russia: through increasing the amount of scientific reviews dealing with the most topical spheres of Ecology, ecological safety, effective nature management, through publishing articles of the authors most ofter referred to, striving to being indexed in international databases in accordance with all the international standards and requirements of the citation indexes Scopus and/or Web of Science, inclusion of the journal in these informational databases and of the basis of agents of other electronic resources. 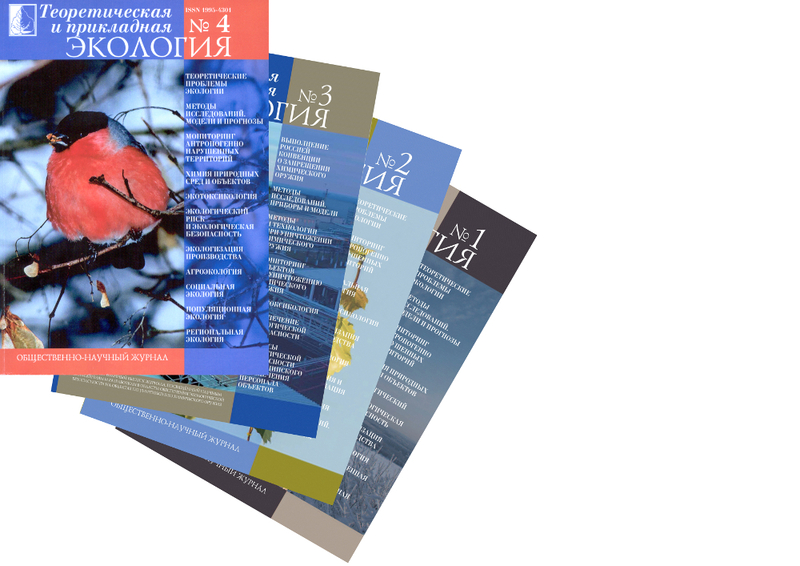 The journal is issued 4 times a year and is spread by subscription and by address mail both in Russia and abroad. In order to add to the image and visualization of the journal there is a free access to its content on the two-language site. The principle is the following free access of the journal contributes to making links and exchange of experience. The electronic archive of the journal is being made with access to whole texts of articles. To get the channels of distribution of the journal it is planned that the journal that is distributed not only by subscription in the Russian segment and in the CIS countries and in other foreign countries, but it also should be included into the free access databases such as (DOAJ, open resources EBSCO, catalogues of the free libraries, including foreign ones; placing at Russian open service platforms, etc.). Free access to articles on eLibrary. According to the current regulation of, only reviewed articles can be published. As soon as an article gets to the Editorial Board it is registered by the secretary of the editorial board and an initial expertise is carried out by the secretary and the editor-assistant, the supporting documents are being considered and it is decided if the article suits the profile of the journal, the article submission guidelines, and the requirements of the editorial board, which are offered on the site of the journal. If the article suits the journal profile and if it suits all the requirements and rules, the decision is taken by the editorial board of appointing a reviewer and a scientific editor from the list of the leading scientists in the research sphere of the article, in case the article does not suit the requirements it is not accepted, without any further reviewing. The main task of the reviewer and the scientific editor is to objectively estimate the content of the article and to make recommendations which could help to make the article better, to improve it, to point at its questionable, not well-grounded statements. Besides, the reviewer and scientific editor can make amendments in the text. The articles which are to be improved are sent back to the authors with the remarks of the reviewer and scientific editor. The authors must take into account all the remarks made during reviewing and editing and to answer to each improvement, and mark the place of the article which has been improved. In case they do not agree with the reviewer and scientific editor the author is to offer a comprehensive and concise grounding of his/her point of view. When an author is asked to work over the article the date of its acceptance is valid during 2 months. After improvement the articles is reviewed and edited again. The decision of publishing an article is taken by the editorial board of the journal on the basis of the results of reviewing and scientific editing, taking into account the fact of its suiting the profile of the journal, its topicality and scientific interest. Articles with negative reviews of 2 reviewers is not accepted by the board, its author gets a well-motivated refusal in publication signified by the chief editor or his/her deputy. In case of any conflict the article is considered at the enlarged meeting of the editorial board. Reviews are kept in the editorial board for 5 years. 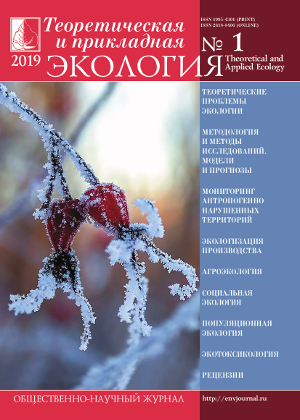 The content of each issue is confirmed at the editorial meeting of the journal “Theoretical and applied ecology”, the meaning of the reviewers and scientific editors is taken into account, as for including each article under consideration in the issue. The volume of each issue is 12.5 printed sheets. Reviews and edited articles which have not been included into the issue are recommended to be published in the next issues. The review is offered in case of a special requirement from the author of the article or the expert board of the State Commission for Academic Degrees and Titles of the Ministry of Education and Science of the RF. Review is offered without any signature, surname, name, paternal name, post, and the place of work of the reviewer. For the purpose of increasing the scientific level of the editorial board a database of external reviewers is being made, it is planned to attract internationally acclaimed experts and foreign scientists with high citation index. Publications in are included into the systems of computation of citation indexes of authors and journals. “Citation index” is a figure that characterizes the importance of the journal and it is calculated on the basis of the postliminary publications referring to this issue. Russian Science Citation Index (RSCI). In their work the editorial board and the publishing house are ruled by the regulation on publishing ethics of the journal “Theoretical and applied ecology” (further on – the journal). The regulations havae been worked out in accordance with the recommendations and standards of the The Committee on Publication Ethics (COPE), as well as the experience of the leading journals. Publication in the journal “Theoretical and applied ecology” makes a considerable contribution to development of the chosen research sphere and helps to connect science, industry, and education. Thus it is important for the journal “Theoretical and applied ecology” to set the standards of ethics for all the parties of the publication process: authors, scientific editors, reviewers, publishing house, and the scientific community. contain the information on any financial support, in case there was any. not to participate in considering the paper in case of any conflict of interests as a result of competitive, common or any other contacts and relations with any of the authors, as well as with the companies or other organizations which are somehow connected with the paper under consideration. to provide refutation or amendments in case any mistakes are found out. The Chief editor of the journal “Theoretical and applied ecology” is personally answerable for taking a decision on publishing every article in the journal and on the whole for each issue of the journal. The publishing house should provide the needed specialized legal services and consulting of the editorial board when necessary. LLC Publishing house «KAMERTON», FSBEI HE «Vyatka State University». A licencing agreement to the right to use the scientific work in the journal is enclosed to the article which is signed by all the co-authors, it confirms that the article has not been published before and has not been sent to any other journal at the same time. The Editorial Board of the journal “Theoretical and applied ecology” can check the material with the system Antiplagiat. In case of any borrowings the Editorial Board deals with the case in accordance with the rules of The Committee on Publication Ethics (COPE). The author should confirm that the article has not been published and has not been accepted for publication in any other journal. International standard serial number ISSN 1995-4301 (Print), ISSN 2618-8406 (Online). Registration number and date of the decision on registration: series ПИ № ФС77-74434 dated November 23, 2018.